The latest obsession of top quality video cameras in smartphones has taken over the world. Smartphones such as iPhone X and Samsung Galaxy S9 plus are coming out with HD video cameras to give traditional camcorders a competition. However, truth is, no matter how the top of the line camera, smartphone offers, it fails to beat the classic digital video camera. Video camcorders are dedicated to video production in specific so there is no way that you can compare the results of these two products. Luckily you have a wide range to choose from depending on your preference and usage. For instance, the video camcorder that you select for whitewater rafting cannot be the same as the one you choose for a family vacation. The specifics of the right digital video camera change according to your requirement. We have put together a list of best cameras for video production for our readers. These HD video cameras can be used by enthusiasts, amateurs or professionals. So without any further ado, lets jump right into it. One of the most important things missing on GoPro Hero4 was the touchscreen, but with GoPro Hero5 all such issues have been resolved. The video has a linear field of view equipped with a touchscreen and a waterproof body. The battery on this one just isn’t up to the mark. GoPro Hero5 isn’t compatible with the old batteries that you may own. When GoPro Hero4 was released, competitors quickly caught up with the technology and introduced something with better features at a lower price. However, GoPro Hero5 came out with tons of upgrades and features making it one of the best video cameras on market. Touchscreen feature caught our attention most since Hero4 didn’t have it, users were disappointed. However, with Hero5, all such issues have been resolved. You don’t even have to worry about the sound muffling and the lens covers are also easily replaceable. Hero5 also has voice control, stereo audio, electronic image stabilization, GPS and cloud connectivity. GoPro Hero5 is nothing short of awesomeness, it has features that nobody thought a small video camera could have. It is a flagship video camera with top of the line shooting features. It is an improved version of GoPro Hero4 with a dynamic range and raw image capturing mode. The auto cloud feature is available for premium customers. Furthermore, the EIS and linear field of view aren’t available at all frame rates and resolutions. The polycarbonate housing was another thing that excited us as it makes the video camera water and dust proof up to 10 meters. However if you are looking for extreme protection, you can get an additional housing case that protects the camera up to 60 meters deep. So, you don’t have to worry about water, snow or mud with this camera. Good news is that you no longer have to go through the three-button setup. Setup and operating the camera is easy on this one. You can turn on the camera, start and stop recording and turn off the camera using the same button. The voice feature could potentially be the coolest feature to date. Imagine you are in a situation where your hands aren’t free, now the only two options that you have are that you either make sure that your hands reach the power button or you don’t capture the moment. GoPro Hero5 allows you to give commands with your voice. You can do multiple tasks with the help of this feature like start recording, take a photo, start time lapse, shoot burst etc. Overall, Hero5 is an extraordinary device to own whether your usage is professional, enthusiast or beginner level. It combines all features from GoPro Hero4 and then adds some more. GoPro Hero5 has a lot to offer and doesn’t compromise on a single thing. As far as the batteries are concerned just keep some extras and you are good to go. Panasonic HC-WXF991K video camcorder is still on the expensive side because of the features that it offers. It has a reversible camera with an automatic lens cover. It records in 24p and has a tilting electronic viewfinder. The size of Panasonic HC-WXF991K is what worried us; it is huge in size and in fact the largest amongst the lot. Although 4K and ultra-high definition video still haven’t matured to its full potential but it won’t belong. With each day passing these, HD camcorders and HD video cameras are becoming more affordable and you may ask, why the hefty price? We will give you a simple answer, it is not only the best 4K HD video camera, it is also the best overall video camera that offers an array of features. There aren’t many competitors out there that give you 4K UHD video recording and Panasonic HC-WXF991K is one of the few HD camcorders that assure you the video won’t turn out to be fuzzy or pixelated. Panasonic HC-WXF991K, unlike cheap camcorders, offer some cool and fun cinema effects like the dolly zoom and super-slow motion. 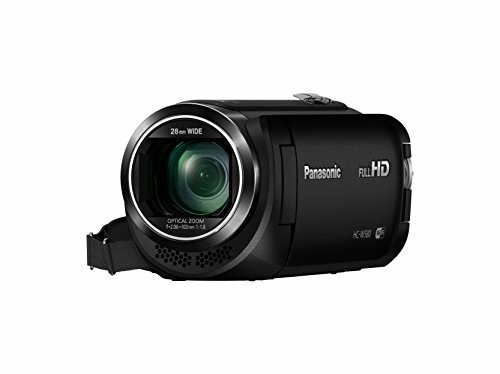 Amongst all the HD video cameras that we tested, Panasonic HC-WXF991K had the highest resolution. The color correction on this one might be a problem for some as the video turns out to be a little blue. If you are shooting outside on a sunny day, the overall video will look slightly grey. The rotating LCD turns into a back facing movable camera is what gives Panasonic HC-WXF991K an edge as you are able to record your surroundings as well as your reactions. The touchscreen is not smudge proof so there is that however it works decently for navigation, editing and settings. You don’t have to worry about the lens cap as it automatically slides when you are shooting and closes when you are done. The worst thing that could happen to a videographer is to find out that they shot the entire thing with the lid on. Panasonic HC-WXF991K may be expensive but when you are getting so much in return you really don’t care much about the price tag. The image and video quality on this one is phenomenal. It comes with a DC cable, AC adapter, USB cable, battery pack and HDMI micro cable. On top of all these things it comes with a lens hood for improved video colors and extra protection. In 2019, users are most concerned whether a product has Wi-Fi connectivity or not. Luckily Panasonic HC-WXF991K has Wi-Fi so you don’t have to worry about transferring files right off of Camcorder. This is what allows a Camcorder to land in the best camera for video category. 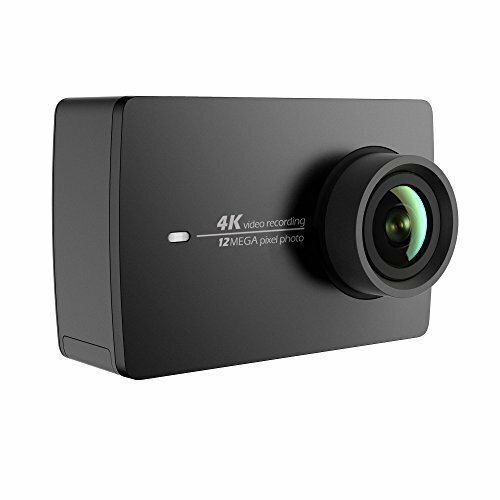 YI 4K Action Camera uses the Sony IMX377 image sensor with Ambarella A9SE75 chipset and Broadcom BCM43340 high-speed Wi-Fi dual-band module. Considering its size, the battery life on this one is extraordinary. You have the touchscreen at the back that allows you to utilize the camera to its full potential. The only downside to YI 4K Action Camera is that you have to buy waterproof housing. Although the touchscreen has Gorilla Glass, it still isn’t shattering proof. GoPro might be the industry leader in action cameras but that doesn’t mean other brands are giving it a competition. YI 4K Action Camera wedges right in between GoPro Hero4 and Hero5. YI 4K Action Camera is a winner for us considering the price point, 4K video quality and a lot of exciting features. 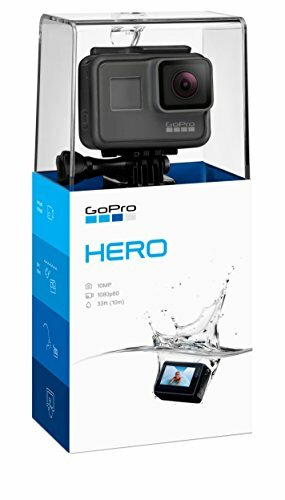 There is no way you could rate it below GoPro Hero4, it is right on point with its features and video quality. Quite honestly, YI 4K Action Camera is the best action HD video camera available at such a reasonable price. It offers an array of features, simple to use and the performance is high quality. The company continues to add new features through regular firmware updates. You might want to know why we are giving this one a go ahead, it is mainly because it costs around $250 and gives you the options that $1000 good video cameras do. It allows you to shoot videos in three different modes 4K (30 fps), 1080p (120fps) and 720p (240fps). The high-end modules that make this camera a beast guarantee excellent performance. As the time passes, YI continues to update the firmware in order to improve performance. YI also introduced a flat color adjustment setting so that editing becomes easier. It also came out with an ultra-resolution setting that digitally stretches a 4:3 into 16:9 aspect ratio video. Along with these tweaks we were hoping to see some sort of adjustment in the chromatic aberration but it didn’t happen. The purple fringing around subjects at a high contrast continued to happen especially in the case of sky and buildings. Although you would not notice if watching on a smaller screen but once you put it up on a larger display, you will be able to see it easily. Unfortunately like any other small sensor camera, the bright scenes will be blown out leaving you a highlighted video. The reason why we need rugged video cameras in our lives is that they are able to surpass the tough situations and this is where JVC comes in with its JVC Everio GZ-R550. Right off the back JVC Everio GZ-R550 has a 32GB internal memory with a QUAD-PROOF body. The 40x optical zoom lens is the cherry on top of the CMOS 2.5M back illuminated sensor. JVC Everio GZ-R550 doesn’t come with an in-built Wi-Fi system. In 2019, this is probably the first thing that most people look at. If you want to capture the adventures of your life or been doing so in the past then you must know that it isn’t easy. JVC Everio GZ-R550 is considered as one of the best video camcorders on this list as it has a massive 32GB inbuilt memory plus it is water and shockproof. The easy to use interface is also loved by the users. If you are looking a top quality HD camcorder then this could be it. Because of the amazing inbuilt memory, you could save a video recording between 2.5 to 3.5 hours depending on the resolution that you are shooting in. In case your video footage is increasing this time stamp, pop in an extra full-size memory card and you’ve got yourself covered. This digital video camera allows you to edit your videos within the camera so you don’t have to transfer files to a third party app or device for editing purposes. What this basically means is that you can instantly cut your videos or even add effects for a different outcome. With JVC Everio GZ-R550 you get a lens cap, AV cable, USB cord, adapter cable and AC adapter. If you think that attaching the lens cap isn’t that important then you are probably right but it will expose your lens to damages. Improving the video quality on JVC Everio GZ-R550 isn’t that difficult as the camera comes with core filters that reduce interference. When JVC Everio GZ-R550 was tested, it proves to rise up from the provided water/shook proof benchmarks. If dropped in a puddle (16 feet deep) of water, JVC Everio GZ-R550 can survive up to 30 minutes. It also works flawlessly even if you drop it from 5 feet height. The video camcorder is still on the bulky and heavier side with 10.2 ounces of weight. All features on JVC Everio GZ-R550 can be accessed with the help of rotating touchscreen. It also features a front-facing light for shooting in low light circumstances. The video will come out pretty clear however it won’t be as crisp or detailed as you’d normally see on a Nikon HD video camera. In order to stand out you need a low introductory price, as a company, you should focus on the things that users hate and this is what TomTom Bandit did. TomTom Bandit has a built-in sensor that automatically tags all highlighted clips in your list for making the edit a tad bit easier. There is no digital image stabilization and the sensors such as GPS only work for tagging purposes. Currently, the market for action video cameras is quite overwhelmed since there is a new launch every other day. In order to stand out in such a situation, what do you think could be the best strategy? 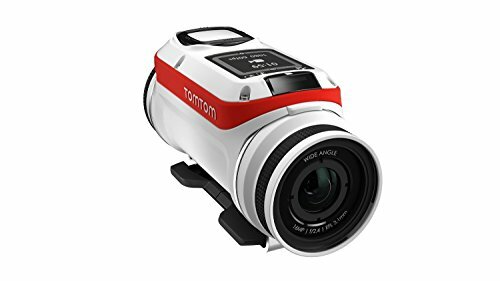 TomTom Bandit addresses many issues that users previously faced with other action digital video cameras. Especially with the quick share, input and mobile editing app life become a lot easier. Overall the features on this one are excellent however the image quality isn’t that great. The performance and design on TomTom Bandit is quite impressive as well. Furthermore, the removable battery and versatile mounting give some bonus points to this one. You can charge the device and share content without the help of a cable. If you want to get your camera in a horizontal position then doing so could be extremely easy with the help of the rotating mount. Quite honestly, provided the price, you can easily find better HD video camera. Some of the top video cameras in this range include Sony’s Action Cam X1000V and GoPro Hero4 Silver. Retailing for $400, Bandit is definitely an investment as you can use the quick release mount with any of GoPro’s accessories making it versatile. If you buy the premium bundle then you get the bar mount handle, wrist control remote, dive lens cover that protects your product up to 50 meters deep, power cable and a 360-degree tilting mount. Bandit is splash-proof so you don’t have to worry about some rain or snow. Since there isn’t a housing option for extra protection, it looks like the Bandit could survive the tough climate. The clip system that comes with Bandit basically addresses to two of our major problems. Attaching and removing the camera to amount is extremely easy, you only have to squeeze some of the tabs and you are good to go. No matter how the camera is mounted, getting it into a horizontal position is easy. The clip mechanism attached to the camera rotates to the left and right allowing you to set the position as required. Since TomTom Bandit is already a bulky handheld camcorder, we don’t want the additional weight of protective housing. The lens cap could be changed though however the distinctive mounting brackets make it easier to remove or attach the mounts and cameras. JVC never fails to impress when it comes to producing top quality video cameras. When the company announced that it was going to launch JVC GZ-R440D EnvrioR everyone was excited. We cannot emphasize enough on the importance of integrated Wi-Fi. Nowadays it is the single most important features that all users are looking for because everyone wants to save time. When tested among other high-quality video camcorders, JVC GZ-R440D EnvrioR did quite well and ranked high. It is a rugged and cheap video camera that doesn’t bankrupt you and provides you with top quality video. It comes in two colors, bright orange and black so the choice is yours, we personally enjoyed the color punch. JVC GZ-R440D EnvrioR records at a maximum of 1080p which results in a clear video. During the outside tests, we could clearly see the vehicle license plate and the crisp roads however the footage was grainy. The color balance on the camcorder asks for a straight A because it is amazing. If you are shooting in a windy climate then the recording might not be as clear as you would want it to be. 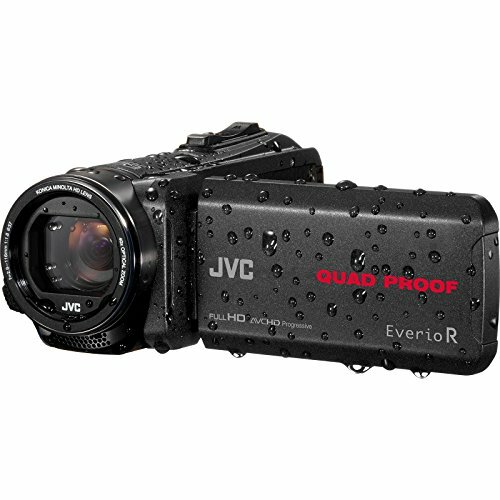 JVC GZ-R440D EnvrioR passes all shock and water tests. The LCD on this one is made from something that doesn’t seem to break, even if you drop it multiple times. The touchscreen isn’t smudge-proof so you have to be extra careful while cleaning it as you may end up pressing a button unintentionally. If you thought you couldn’t get digital image stabilization and editing capabilities at this price tag you were wrong. The video camcorder has some internal features to look out for, these are usually available in the more expensive counterparts but video camcorder didn’t fail to impress. The biggest disappointment with JVC GZ-R440D EnvrioR is the unavailability of Wi-Fi, although you can transfer your data through SD card or cable it just isn’t the same as cloud transfer. The internal memory isn’t massive but 4GB is still good enough, you can use additional memory cards along with it though. This internal memory can be quite useful in case of an emergency when you’ve run out of memory card space and you just need a couple of minutes to complete your shoot. It has a 40x optical zoom and 60x dynamic zoom capacity meaning that you can take some of the most amazing images from afar. Overall this cheap video camera provides you with features that you’d normally find in a more expensive camera so we would suggest that you go for it. Considered as one of the best action digital video cameras on the market Nikon KeyMission 80 is bringing new things to the table. Integrated Wi-Fi in a camcorder with a touchscreen is probably the feature that a company could give. Besides that it is also water and shockproof which means you can be tension free on your adventurous trips. This small video camcorder is compatible with a microSD card, which is easy to lose. You don’t get a zoom feature on Nikon KeyMission 80 and some people complain that it is easy to lose the camera itself because of the small size and lightweight. Although many video camcorders claim that they are water and shock proof but on the ground, a lot of them fail to live up to the standards. Nikon KeyMission 80 is a beast, even after repeatedly dropping the camcorder, it continued to work just fine. The touchscreen was responsive like it was before and nothing really changed. The size may try to fool you but you have to be smarter than that. This tiny little voice-recorder look alike camcorder is capable of a lot of things. Nikon KeyMission 80 has the best video outcome amongst all camcorders that were being tested. The video footage was also tested for color levels and it performed quite well there too. The colors and crispness of the footage seem just right and on point. We have repeatedly said that Wi-Fi is the most sought-after feature nowadays because no one wants to waste their time in connecting the device and transferring data. We feel that Nikon KeyMission 80 and GoPro look quite similar. Nikon KeyMission 80 weighs around 2.7 ounces and performs amazingly in the water drop test. So next time you plan on going white water rafter, don’t forget to pack your Nikon KeyMission 80 along. It doesn’t come with a lens cover and you cannot zoom at all however the footage turns out to be quite clear. One of the cool features of Nikon KeyMission 80 is that you can record your own video with the help of the backward facing camera. The touchscreen on this camcorder is probably the most responsive we’ve seen in all entries. It mimics the responsiveness of an iPhone’s screen and you can navigate through the settings for accessing the features that none of the other camcorders offers. 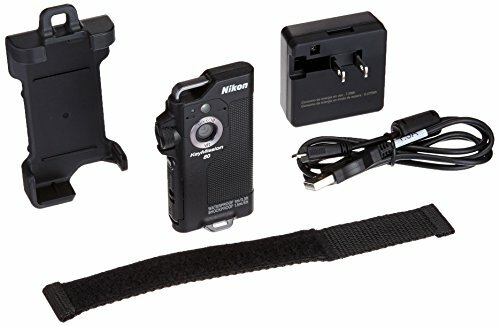 You also get a camera holder with Nikon KeyMission 80 that you can easily attach to your clothes or bag pack. The camera has a magnet attached to it which allows it to stay off when it is in the holster and turns on automatically when removed. You have to use a microSD card for recording all your footages however because of the small size you can easily lose it. The camcorder itself is so small that you can lose it on a trail or while rafting so you need to be extra careful with it. Make sure you pack it carefully and keep it protected. Ricoh, Japanese company is known for manufacturing electronics came out with the first point and shoot camera targeted at consumers for spherical images. Controlling a camera has never been easier, you can do so with the help of Ricoh Theta S mobile application and Wi-Fi connectivity. The image and video quality is affected while processing so it is better if you don’t pay a lot of attention. The user experience also isn’t great either because of separate capturing and editing apps. Ricoh Theta was the first of its kind 360-degree camera and Ricoh Theta S is the latest rendition in the line. The design has remained the over the three generations and even the ultra-wide angle twin lenses used on the Theta S is the same as original Theta. The twin lens technology allows you to capture a spherical image to its full capacity. You can use, share and edit photos/videos with the app. The timer allows you to get better selfies and shots. If you plan on uploading the video/image to another website, it is essential that you first upload it on Ricoh’s site. The storage space cannot be extended and you have to careful while storing the camera because of the twin lens design. Ricoh Theta S boasts f/2.0 twin lenses that have a longer optical path because of the folded optics. The body is still small with an image sensor of 1/2.3 inch, 12-megapixel dual cameras combined with the spherical image of 14 megapixels. The option of recording spherical videos on Theta S is also available at 30fps with HD quality and stereo sound for up to 25 minutes. The design is super trendy and easy to use however you do expose the lenses to possible scratches if you don’t store in a pouch. The body is sealed so you cannot replace the battery or increase memory space. It has a built-in 8 GB memory that allows you to record an hour-long full HD video or 1600 images. Battery life, on the other hand, can be a pain, Ricoh claims that you can take around 260 images with your Wi-Fi connection and you can also take and transfer an image every thirty seconds to a mobile or device. Using Ricoh Theta S is super simple and easy, turn on the camera and press the shutter release button. Since it is a spherical image, you aren’t really pointing at anything and because the shutter release and one of the lenses are placed next to each other your thumb will appear in the image larger than normal. After continuous efforts to compete with the frontrunner GoPro, Sony Action Cam FDR-X1000V might just be ready to beat it with just a scratch. Sony Action Cam FDR-X1000V has XAVC S codec and records 4K videos at 100Mbps. You get to control the white balance, exposure and the HD video camera comes with digital image stabilization. The response time for menu navigation is a little slow which can be irritating. Lens casing gets smudgy and shooting in water can get to your nerves as droplets adhere to the front. If you’ve been into action cameras and your familiar with what Sony usually comes out with the Sony Action Cam FDR-X1000V’s design isn’t different than what we’d normally see. The shotgun style housing keeps the camera housed with a flattened base so you don’t have to support it using other stands. Sony Action Cam FDR-X1000V, when removed from the waterproof casing, can stand on its own. Mount for tripod and external mic jack is located at the bottom of the camcorder. FDR-X1000V HD camcorder has IPX4 rating and it is splash-proof so you can take it along on your adventurous water trips. Besides that the premium package comes with a waterproof casing that you can use for shooting up till 30 meters deep. If you are an extreme diver and you want the video camcorder to work up to 60m deep then you can purchase the dive door. The performance and features introduced in Sony Action Cam FDR-X1000V are ready to take the competition to a whole new level. It doesn’t end there, Sony Action Cam FDR-X1000V boasts a 170 degree Zeiss lens at f/2.8 for shooting all your spills and thrills. The main thing that differentiates Sony Action Cam FDR-X1000V from GoPro is the reduced 120-degree field of view with working image stabilization. One of the biggest advantages of Sony Action Cam FDR-X1000V is that is shoots in 4K shooting resolution which you already may know is the talk of the town, everyone wants the best features at a reasonable price and this is exactly what Sony Action Cam FDR-X1000V offers. You can record in multiple options as per your requirements. Accessing the menu and navigating through it also quite easy. If you enjoy shooting in action mode then this camcorder will definitely impress you with its features. The stereo microphone is placed beneath the lens and it has a wind cut filter. Operating it is simple as the configurations remain the same as previous models. You can use the next and previous buttons on the side panel for navigating through settings and menu. Panasonic is known for bringing out the best digital video cameras. The company’s aim is to provide an array of features at a reasonable price with Panasonic HC-W580. The reverse camera along with 50x optical zoom gives this camera a new perspective and attracts many users. As a 2019 best camera for video, there has to be some sort of an in-camera editing option. Panasonic HC-W580 fails to provide the users with it. It is important that your product stands out in the market and the phenomenal zoom lens on Panasonic HC-W580 does just that. There is a lot about this camera that attracts potential users, one of the features being the reverse camera so you can record your surrounding and yourself simultaneously. You also have the option of shooting the videos in 1080p resolution while it cannot be compared to the 4K UHD resolution, it still is pretty competitive. After the test results, we came to the conclusion that HC-WXF991 delivered better image and video quality but there is a price difference so the quality difference is also expected. Color balance on this video camera is just average, nothing too amazing. Even if you record the video on a sunny day, the footage will turn out to be a little gray. The red, blue and green color levels wouldn’t be in line if you put the footage on editing software. It is a good video camera that comes with Wi-Fi connectivity so you can easily transfer files directly from the camcorder. The package comes with several accessories including HDMI cord, USB and AC adapter. You can easily detach the battery so you can keep some extras as backup in case your batteries end in the middle of a shoot. You can insert a full-size SD card which is great as the chances of losing a microSD card are quite high. Battery consumption completely depends on your usage. Shooting at full resolution will eat more battery as compared to shooting at lower resolutions. You nearly get an hour of shooting time. The camera leans a little on the bulky side with 10.9 ounces. As you know holding heavier cameras over a longer period of time could be difficult so you need to consider that as well. However, when you are shooting free hand, bulky cameras don’t shake a lot and feel sturdy. In a world full of HD video cameras it is essential that you stand out if you want your product to do well. Besides the reduced price, it is essential that you come out with a feature that attracts users. Thanks to the 50x optical zoom, you can capture from afar without worrying about the quality. This is the most extreme zoom lens on this list of top video cameras. Although it can go up to 90x zoom but that will only ruin the image quality. It has digital image stabilization, automatic lens cover and 10mp camera for taking crisp images. 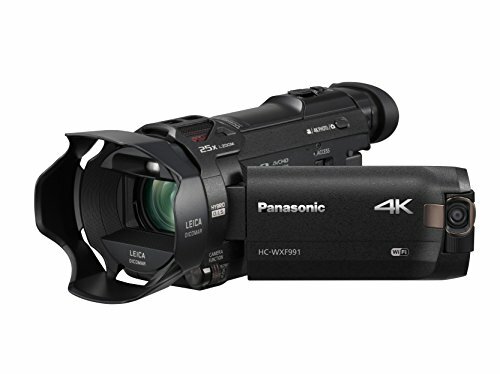 While other flagship camcorders from Panasonic have moved to the 4K category, Panasonic HC-V770 remains to be the top and best HD camcorder from Panasonic. If you aren’t interested in shooting in 4K UHD, then this is the only HD video camera that you will need. Panasonic HC-V770 is a good value for the money, the control dial and settings are easy to use. You can navigate through the camera without worries and on top of that it has Wi-Fi connectivity. The biggest issue with this HD video camera is that it doesn’t have 4K shooting mode. Besides that the image sensor used in Panasonic HC-V770 is much smaller than the one used in a DSLR plus it doesn’t have a lens ring. 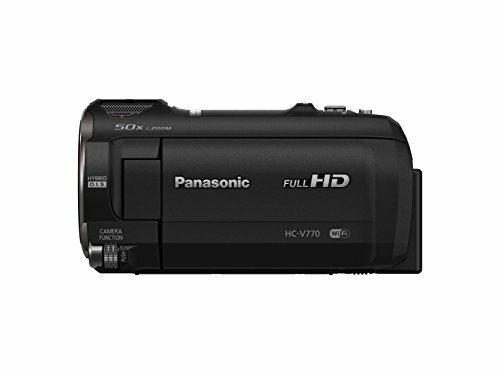 Panasonic HC-V770 is considered as one of the best full HD camcorders available on the market. 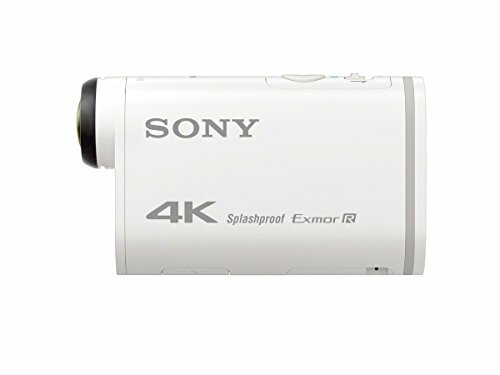 Since it doesn’t have 4K recording you cannot compare it with 4K footage results, however the features provided in this camcorder compete for top video cameras available today. If 4K isn’t your priority then we recommend that you go for this as it is the best overall video camcorder. HC-V770 comes with CMOS back-illuminated ½.3 inch image sensor with 12.76mp. These specs, as compared to a camcorder, are huge however small when compared to the DSLRs.6.03 of the megapixels are used for images and videos which is three times more than what is actually required for full HD. The reason why it uses the extra resolution is to amplify the intelligent zoom. Hybrid Optical Image Stabilization is another feature introduced in HC-V770 which requires the extra resolution. This technique proves to be most effective when it comes to compensating rotational, vertical and horizontal movements along its axis. 1080p at 50 progressive fps is the top resolution that this camera offers so no 4K expectations here. You can also use this HD camcorder for recording a full HD slo-mo at 100 frames per second. The price is just right for the quality that it is providing and it competes with the frontrunners of the market. So, if you don’t want 4K video go for it. Your Buying Guide to Best Camcorders! Is this your first-time camcorder shopping? Are you confused because of the massive range available in the market? Don’t worry; we are here to make your lives easier. As you just read we have compiled a list of top video cameras that you can choose from but before you start selecting there are certain things that you need to consider. Before you jump into the browsing procedure, you need to ask yourself some questions. What is your budget and what type of videos do you think you will be making? People require different features for different purposes. For instance, someone who might be shooting weddings will look for different features than the one looking to shoot a soccer game. Sorting the priority or the need to of the camcorder will allow you to narrow down the features that you’ll be looking at. Let’s say, you want to shoot a soccer game what do you think you need the most? Good imaging is what you require so you can lay low of sound quality. However, when shooting in concerts, your main focus is to get the right sound. Moving on, never move away from your budget. Sit down and sort your finances make sure that you allocate the right amount to this purchase. If you plan on purchasing it for your business or professional usage then make sure that it is an investment. Your shooting priorities aligned with your budget will help you choose the features easily. Mainstream: a mainstream camcorder is a most commonly used camcorder with the widest usage range. These are great when it comes to making personal home videos, event videos and game videos. Advanced: these offer more features and options as compared to mainstream camcorders. Advanced camcorders are usually used by professionals and enthusiasts however regular consumers also use them for enhanced image quality. Pocket: these are designed to fit in your pocket as they are small and compact. Although these are small but the video quality produced by these is top notch. Bloggers usually use pocket cameras because it doesn’t tire their arms and produced high-quality imaging. Mountable and Wearable: these are point and shoot cameras that attach to almost everything whether it’s the surfboard, vehicle, clothes or backpacks. These capture action footage amidst the chaos so you don’t have to worry about capturing the right moment. The resolution of a camcorder specifies the pixels in the video footages. As the pixels continue to increase, image clarity and detailing also enhance. A couple of years back standard definition and high definition were the main competitors but now it is 4K and high definition. 4K resolution is the best that the cameras have to offer so naturally people lean towards that. However, you need to determine what resolution you are looking for. As the resolution increases, the price tag on the camcorder increases too. So just keep that in mind. The sensor size of a camcorder has a lot to do with the video quality. Normally larger sensors are used for capturing high res videos however some 4K camcorders use ½.3 inch sensor size while other use a massive 1inch sensor. When the lighting is limited, the sensor size plays an important role. A larger sensor can help shooting in low light without making the video dull or grainy. If you know you won’t be shooting in low lighting then going for a larger sensor isn’t that important. However, if most of your shoots are in dark lighting situation then we would suggest that you consider a larger sensor. When you comparing cameras with the same resolution and sensor size then the next thing to consider are its bit rate, look for cameras with higher bit rate. When the bit rate is high the video quality automatically improves. Although bitrate isn’t that important however when there are two cameras in question with the same sensor size and resolution then it can turn out to be the winning factor. However, there is a negative aspect to higher bit rate as well. It fills up the memory quicker than lower bit rate so you need to consider what you require. Considering the inbuilt memory and the option of extending it is also something that you should consider. Although most cameras support external memory cards some have sealed bodies restricting you to stick to the inbuilt memory. Either way, you need to consider your usage and then determine how much memory you will need. This, in our opinion, is extremely important. Imagine some of your best shots turning out to be shaky, image stabilization prevents that and provides you with a smooth footage. Optical image stabilization is the most effective way of having a smooth video. It is better than digital or electronic image stabilization this the higher price tag. This comes in handy especially in the case of freehand video making or action videos. Zoom can have quite an impact on your footage but not all zooms turn out to be the same, optical zoom is way better as compared to others. It adjusts the lens on the camera without cropping the image. So if you shoot for wildlife or sports, this will turn out to be highly helpful. Most of the users out there mainly focus on the quality of video and often forget that the audio plays an equally important role. Especially if you are in a musical scenario or conducting an interview, having a good camcorder audio can be quite helpful. So, it is better that you check the audio on the camcorder before going for the video features. These features and aspects combined make an awesome choice for a camcorder. This was our list of best video cameras on market. We hope this was helpful, for further details and queries please feel free to contact us.